so we've all seen what goes down on the intenet, get-rich-quick scams are everywhere nowadays. And yes, they are rather annyoing. pop-ups, junk emails, even google ads! why are they here, and do any of them actually work? well, most get-rich-quick ideas have something to do with advertisement. such as AdSense, which many bloggers are familiar with. However, there are three sites that i have actually deemed worthy. Firstly, is Inbox Dollars. this was shown on (if i do remember correctly) Good Morning America AND the T yra Show. since i absolutely looooveTyra, i decided it was worth a few seconds of my time to check it out. i asked around and did some research, and boy, is this one easy! well worth the signup. (which is free. yay!) infact, when you sign up, they give you a five dollar bonus. isn't that neat! the way this company works, is they send you two - five emails a day, and all you have to do is click them. no, Really! just click! you get paid for every emeil you can confirm reading. and comfirmation only takes one click of the mouse! Also, you can get paid to play online games, and take surveys. the minimum "cashout" (the amount of money you need in your balance in order to request a check in your name) is $30. seems like a lot, but it actually flies by. if you check you email inbox about once a week, and take a couple surveys each month, you're already on your way to extra money in your pocket! Click here to sign up, and get your first $5 instantly! Another Great way i have come across is Mindfeild Online. This is a survey-only website, that pays anywhere from $1 to $7 for each survey. This website also send you emails everytime you are eligible to take a new survey. the biggest perk about this website is that you only need a minimum of $5 to request a check in your name! i've already gotten three of my own, and i've only been a member for a month! Also free to signup, and you get a $1 dollar bonus when you sign up for free! Of course, these companies won't pay your bills or buy you a big fancy home, but they definitely help feed all the hungry empty wallets out there right now. It's a fact, more people than ever are in debt now, and almost everyone would like to have a little extra spending money. Well, Now you can get just that! someof my favourite ways to spend my "Internet monies" are by donating to organizations like World Wildlife and Samaritan's Purse, and i admit, i like to treat myself to a fancy dinner or a spa treatment once in a while. Planning on a trip to another country soon? well, next time you do, check out the coins there. PetSalad (or Rob, if you'd like to go the more formal route) can make some beautiful pendants out of your rare and spare change. 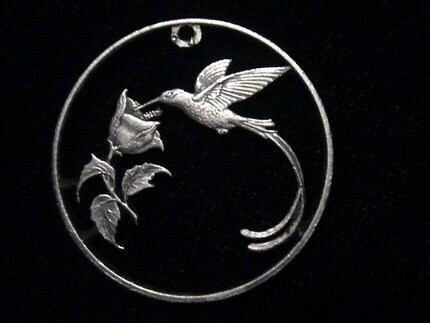 one of my favourites is the hummingbird, carved from a jamaican 25 cent coin.